In 2015 Nightwish released their eight studio album called Endless Forms Most Beautiful and then they went on tour consisting of 149 gigs through many countries like Brazil, China, Singapore Russia and many more. Now you can enjoy the best gigs of this tour on a triple DVD with the title Vehicle Of Spirit. 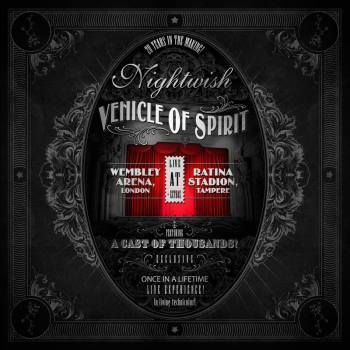 The first DVD features the show in Wembley Arena and the second DVD shows the gig in Tampere and on both shows Nightwish delivers a set list that will leave every diehard fan catching for breath. Highlights of the Wembley show are without any doubt The Poet And The Pendulum and the very long epic track The Greatest Show On Earth, which clocks over twenty minutes. On the Wembley DVD this song is very special as biologist Richard Dawkins enters the stage to talk about his vision on the evolution theory. The second DVD with the Tampere show is a home match for Nightwish and the band announce lots of songs in Finnish... Highlights on the second DVD are My Walden, The Islander and again the epic The Greatest Show On Earth. The last DVD contains bonus tracks recorded throughout the world and a short interview with Richard Dawkins. Nightwish has become one of the greatest symphonic metal bands in the world and they prove that with these outstanding DVDs; which are a MUST for the fans, for me personally it is a bit too much of the same and I think that the DVDs are too long, at least for me. But, Floor Jansen sings like a true metal goddess! !